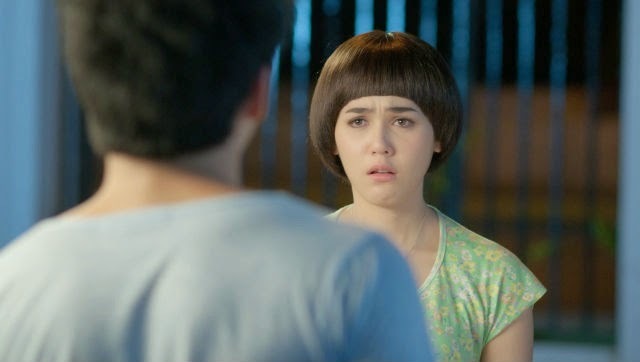 “Crazy Crying Lady (Khun Nai Ho)”, actually I’m not so fond of this movie, but since my wife has downloaded this movie specifically for both of me watching ya follow-up to watch and it is indeed a lot of scenes “crazy” and hilarious typical thailand. Crazy Crying Lady (Khun Nai Ho) tells of a woman named Ho who always wanted to conceive and have a baby. Ho’s mother and sister were killed in an accident when she was a child. 20 years later, adult Ho still lives with his father, Captain Burapha, a retired war veteran who just wants to return to the battlefield. Captain Burapha demanded Nava, Ho’s brother, to act like a real man. Boyd, lover Ho, always trying to invite Ho to make love. Despite wanting a baby, Ho does not want to lose her virginity. Ho’s little friend and neighbor, Doc, know what Ho wants. Unfortunately, Doc finds Ho suffering from a disease that makes his uterus stop functioning earlier than a normal uterus. This means Ho must find the right man and realize his dream or all will be late. “Superstars (Superhap)”, you are sick of lipsync’s show? in the movie “superstar” you might laugh when watching lipsync in this movie. “superstars” tells of Tom and Teung, two friends who had been friends since childhood. And until now they are still the same with the advantages and disadvantages they have each. Tom, who was born physically lucky, has a very handsome face and a good dance, and much admired by any woman. Unfortunately, people will instantly be disappointed when they hear him speak with his voice even more raucous than a duck. While Teung was born unlucky with a face that can be spelled under standard, black, and short, but anyone who heard his voice would be amazed. Since childhood they are accustomed to lipsync unnoticed by others. the movie is really hilarious, please watch. “Suckseed”. many movie fans fall in love with the movie after watching this movie. The highly styled Thai film ABG (the new boy) is about the efforts of a shy boy named Ped to maintain a love affair with his girlfriend Ern while keeping his friendship with his best friend Koong who also fell in love with Ern. curious about the movie? please see the trailer first. The Top Family, which was originally a family, suddenly went bankrupt and had a debt of 40 million Baht or worth 12 Billion Rupiah until finally his house was forced to be seized by the Bank. For this reason, Top’s family moved to China with his sister and Top man. Top, however, does not want to move to China. He still wants to be in Thailand, even though he has to live alone. Finally, Top lived alone in Bangkok while his parents and relatives moved to China. Top continues to look for ways to survive and also he wants to help his family circumstances that are in difficult times. Capitalize the remaining savings and reckless capital, Top was trying from one business to another. But, the name people start a business must not be easy. There are always obstacles and problems facing when starting a business. However, Top never give up and keep trying until finally comes the idea to make food from seaweed. This idea he found when Lin (Walanlak Kumsuwan), lover Top, bring Top fried seaweed that tastes good enough this is the beginning of snack Tao Kae Noi found. Again, there are problems, but he still tried to start from learning to fry seaweed properly and also marketing. Top aware that the world of commerce is more cruel than he has been doing in the world of online gaming. Still a single at an age that can not be said to be young again, coupled with the fact that her best friend since she was just married, made Mei Li (Cris Sirin Horwang) end up in a drunken state on her friend’s wedding night on Valentine’s Day. But who would have thought, the incident that night was a puncture for Mei Li to meet with Loong (Ken Theeradej Wongpuapan), handsome men who work night shift as engineers at BTS Skytrain. Although Mei Li works during the day while Loong is at night, the time difference does not prevent Mei Li from trying to get to know Loong further. Behind the story of this film which is amazingly whole and hilarious churning belly, stored love story Mei Li and Loong who could jerk us to the fact that there is, that at least love requires sacrifice. Love does not mean having to meet every day, eat together all the time, but at least love needs togetherness. Togetherness over the sacrifice of each party to the time they have, to be given to their loved ones. The film’s director, Adisorn Tresirikasem, successfully wrapped this idea in the storyline of “Bangkok Traffic Love Story” which is fresh, light, and very entertaining.